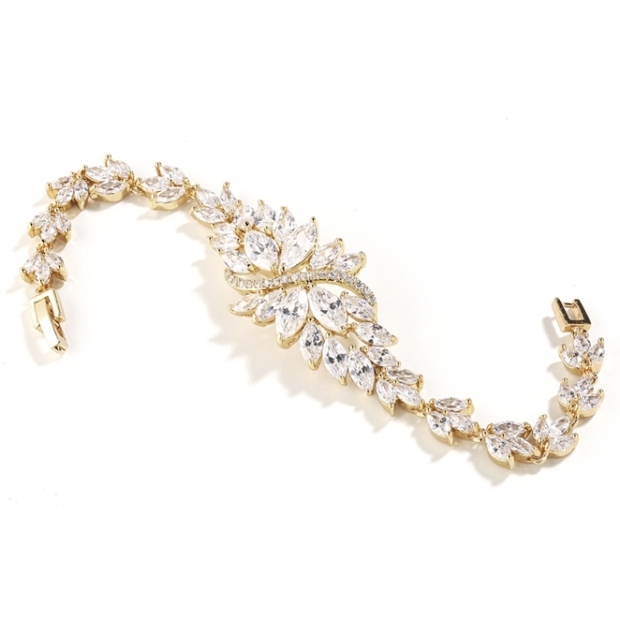 * Mariell's elegant wholesale Cubic Zirconia Bridal Bracelet features dainty marquis clusters. * This popular 7 1/2" wedding bracelet is 3/4" wide at the center and is plated in a rich Gold tone setting. * This unique 7 1/2" bracelet is the perfect accessory for brides, bridesmaids and prom girls. * These regal 14K Gold plated bracelets are also available in Petite 6 1/2" length as style 4014B-S-6. * Both lengths are also stocked in Genuine Silver Rhodium. * These striking bracelets are a must have for your wedding jewelry display and are sure to delight your customers!